I live in the African bush and these Southern Carmine Bee-eaters are regular annual visitors to my home right in the tree next to my verandah. 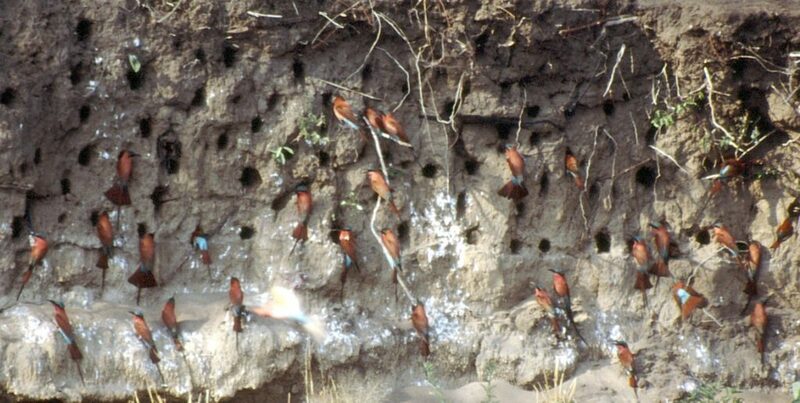 They are Intra African migrants and their nest sites are excavated straight burrows into a sandy bank, returning annually to the same site each year. They live in enormous colonies anything from “100 to 1000 pairs” . I actually had the privilage of observing a colony along the Zambezi valley over a period of 17 years, they very so beautiful, it is no wonder one becomes interested. There are some 19 species of bee- eaters on the continent of Africa. As ones interest grows so you start to realise how fascinating and important bird conservation is. They are indicators of what is going on in the environment. For example: when insect life during the Green Season appear to be less, the bird life is not as prolific. One asks the question – Is this due to crop spraying with chemicals? This does become a concern from a bird conservation point of view. Protected habitats provide life for an enormous array of animal and plant life. Organisantions such as Birdlife International and local conservation groups are working hard to help protect birds and their habitats. Africa has some 2100 species in Sub Saharan Africa. 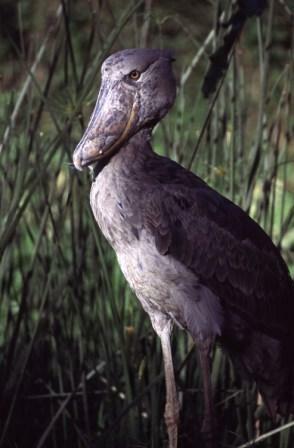 Endemic to Africa, found in the Swamps of Central Africa. Its status is “Vulnerable”, uncommon to rare. Contact us to book a customised Special Interest Birding Safari and add Africas’ birds to your life list!